Toyota Motor Corp. has been offered $146.5 million worth of tax breaks from the State of Kentucky to add production capacity at its Georgetown plant where, a company source told Reuters on Thursday, it will build the Lexus ES from 2015. The Georgetown facility will eventually produce as many ES cars as Toyota sells in the U.S. and Canada, which last year added up to 59,000 cars, the source said. 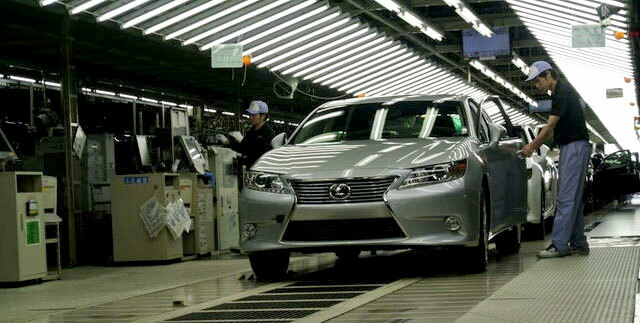 The ES hybrid variant will still be made exclusively in Japan, he added. The tax incentives being offered by Kentucky would be spread over 10 years on an estimated investment of $531 million, creating 750 new jobs, according to a copy of the preliminary approval. This marks the first time that a Lexus has been built in the USA — the official announcement is expected tomorrow at a press conference with Toyota president Akio Toyoda and North America CEO Jim Lentz. The automaker plans to produce new Lexus models at the Kyushu plant to maintain domestic production of 3 million cars annually. The company is also planning to build a compact SUV, currently under development, at the factory. It aims to launch the new SUV next year.